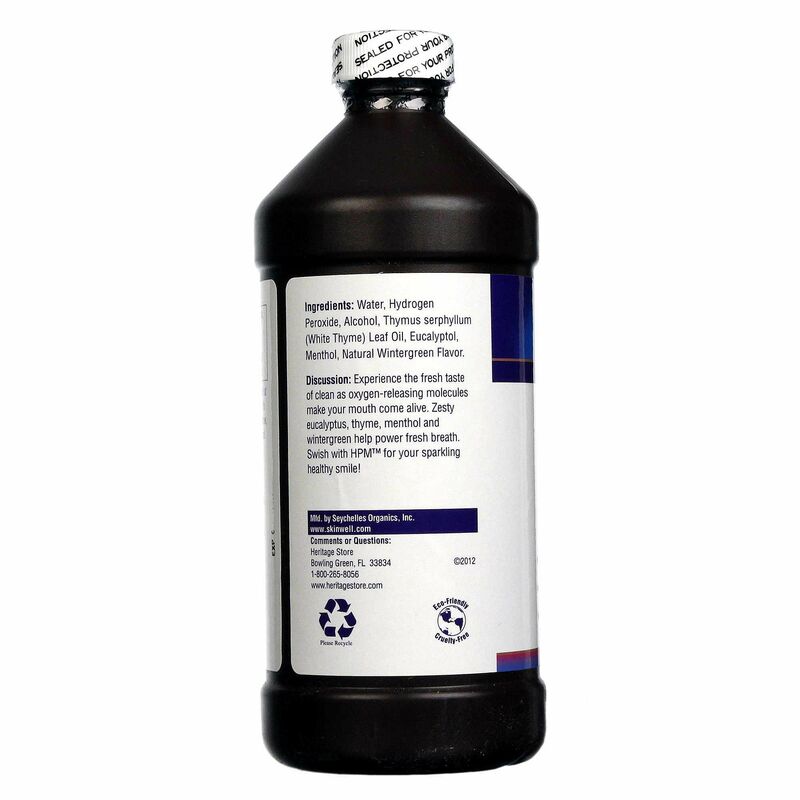 For maximum oral health and clean, fresh breath try the incredible, herbal blend of Hydrogen Peroxide Mouthwash by Heritage Products. Hydrogen Peroxide Mouthwash utilizes the powerful oils of eucalyptus, menthol and thyme combined with hydrogen peroxide to bring you a super effective mouthwash that actually tastes good. The oxygen releasing molecules of hydrogen peroxide cause a foaming effect which gently removes stains for a healthy, sparkling smile. Keeping your breath fantastically fresh and looking after your oral health without the burn of normal mouthwash has never been so easy! Order a bottle of Heritage Products' Hydrogen Peroxide Mouthwash from eVitamins today, for amazing savings! Warnings: Do not swallow. If irritation, pain or redness occurs, consult a doctor or dentist promptly. Keep out of the reach of children. Use by children under 12 requires adult supervision. For use by children under two, use only under supervision of a qualified professional. These statements have not been evaluated by the FDA. These products are not intended to diagnose, treat, cure or prevent any disease. 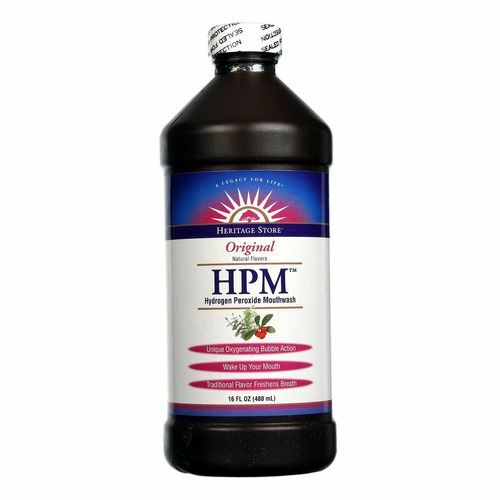 Ingredients: Water, Grain Alcohol (Ethyl alcohol, final percentage alcohol is ~5.5%), food grade Hydrogen Peroxide (final percentage in HPM is 1.8% hydrogen peroxide), Eucalyptus, Menthol and Thyme Oil. Directions: Swish 2 tsp of mouthwash for at least one minute and expel. Use up to four times daily after meals and at bedtime, or as directed by a health professional. 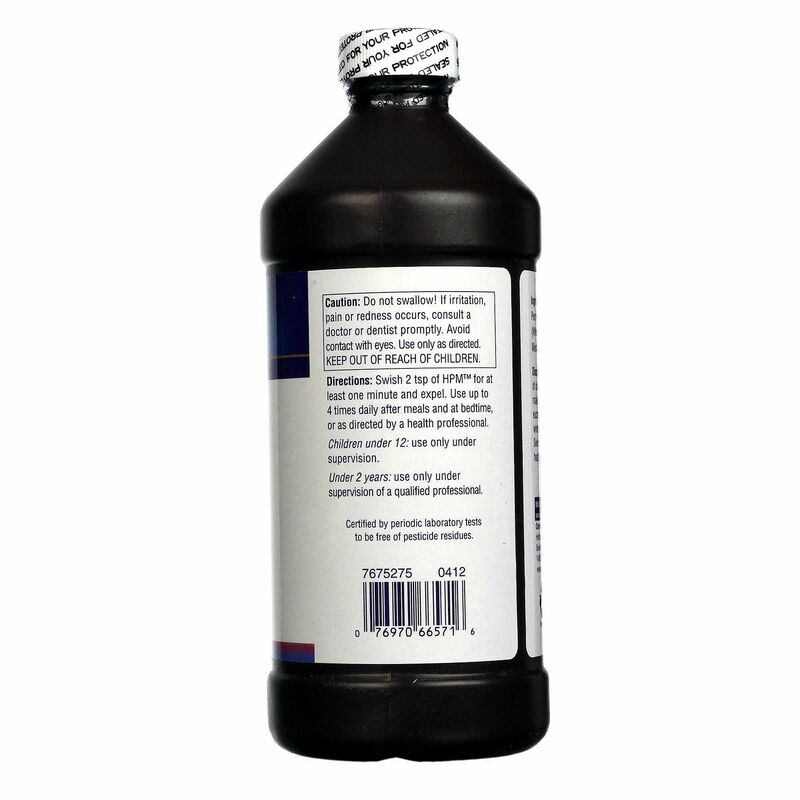 The customer reviews posted below are based on individual consumer experiences and may NOT necessarily represent what expected results will be from using or taking Heritage Products Hydrogen Peroxide Mouthwash - 16 fl oz. These results may not be typical and you should not necessarily expect to receive the same results. Actual results may vary. Even though the taste is not great, it Kills bad breath instantly.